SINGAPORE — President Donald Trump rocked the region with the stunning announcement Tuesday that he was halting annual U.S.-South Korean military drills — and wants to remove the 28,500 U.S. troops stationed in the South as a deterrent against North Korea. Trump’s surprise, almost offhand comments, made during a news conference after his summit with North Korean leader Kim Jong Un, seemingly upended decades of the U.S. defense posture on the Korean Peninsula. Trump has now essentially adopted the standard North Korean line, calling the military exercises a “provocative” drain of money and announcing they would stop while he continues talks with Kim, whom he repeatedly praised as a solid negotiating partner. Seoul’s presidential office told The Associated Press that it was trying to parse Trump’s comments. The South Korean military seemed similarly surprised. The issue involves a joint U.S.-South Korea military exercise that Pentagon officials say should be anything but threatening. Trump’s comments will be questioned by many in South Korea and beyond, with some seeing in them an effort by North Korea to drive a wedge between Seoul and Washington. North Korea regularly calls the military exercises provocative preparations for a northward invasion, and many of the scariest standoffs in recent years on the Korean Peninsula have happened when the drills were being staged. Outside analysts believe the North objects to the drills because it must spend precious resources on its own war games and troop movements. North Korea also insists that the U.S. troop presence in the South, as well as its nuclear “umbrella” over allies Seoul and Tokyo, are part of America’s “hostile” policy toward the North. 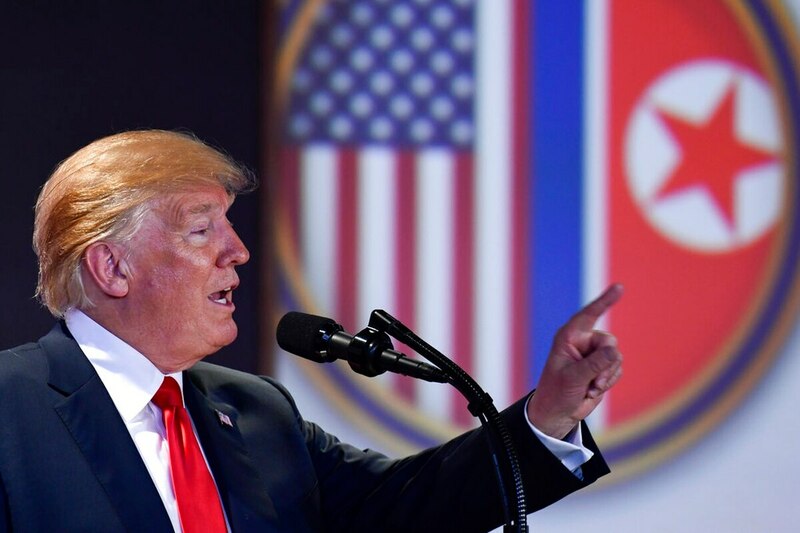 Trump’s announcement that the U.S. would stop military exercises, his description of those drills as “provocative” and his suggestion that he wants to pull U.S. troops out at some point are “all things that Trump is putting on the table as concessions, all in exchange for some vague promises by the North Koreans,” said Paul Haenle, a former China director at the White House National Security Council in the Barack Obama and George W. Bush administrations. Annual military drills between Washington and Seoul have been a major source of contention between the Koreas for years, and analysts have wondered whether their continuation would hurt the inter-Korean detente that, since an outreach by Kim in January, has replaced last year’s insults and threats of war. North Korea last month broke off a high-level meeting with Seoul over South Korea’s participation in a two-week military exercise with the United States. Moon Seong Mook, a former South Korean military official, said Trump’s comments on the drills confirmed what many in South Korea had feared all along — that North Korea would attempt to drive a wedge between Washington and Seoul and gain substantial concessions from an unconventional U.S. president who thinks much less of the traditional alliance than his predecessors.